"Paris is a seductive and enigmatic city. The mysteries of Paris whisper to you as you wander along cobble-stoned streets named in centuries past, peer into gated courtyards surrounding elegant salons, and hear the discreet laughter of Parisian couples sipping champagne in a local cafe. As a tourist, how can you step off the tourist treadmill of museums and monuments to experience the true essence of Paris? A 27-year old Parisian local and graduate of the Sorbonne, Adeline Marchand has the answer. She created Espirit de Paris tours to share with Americans the effortless sophistication, cultural heritage and modern spirit of Paris. Adeline Marchand of Espirit de Paris standing in the Place des Vosges. On a recent tour with Adeline, we traveled by Velib, the comfortable, rental bikes that Parisians use to navigate Paris, to tour Adeline's childhood home, the chic and artsy Marais area on Paris' right bank. Cruising through Paris on our bikes, we sampled rich, mouth-watering chocolates at a local chocolatier, shopped for the latest fashions in chic boutiques, toured off-the-beaten track museums, peeked into secluded gardens and learned about the history of the Marais. During the 3-hour tour, Adeline passion for her home and effortless ability to switch between discussing 18th century architecture, Parisian fashions, historical figures and cafe etiquette, gave us a unique perspective on Paris "past and present." The major benefit we found from taking Adeline's tour is that she is a native Parisian - not an American expat like many tour guides. Her anecdotes and choice of which stores, gardens and buildings to tour gave us an insight into Paris manners, education, and culture that seems to be lacking in other tours. When asked what she wished that Americans could take away from their visit to Paris, Adeline replied "I wish Americans would understand the spirit of Paris, the Parisian state of mind, and the essence of Parisian casual chic...French luxury is discreet...not ostentatious and not about money...in Paris what is hidden is the most desirable." Adeline's goal is to show you the hidden secrets of Paris and share with you the "joie de vivre" and "espirit de Paris." Marie-Antionette Tour - One of Adeline's favorite tours, she explores her specialty, 18th century France. Walk back in time by winding through the maze of streets in the Marais stopping at private mansions from the 17th and 18th century. You'll learn about the history of this tumultuous time period and the aristocracy's passion for fashion and objects d'arts. On this 4-hour tour, you also indulge in a chocolate and a macaroon tasting. French Kitchen Workshop - A hands-on cooking workshop with a Parisian chef in an exclusive glass-domed loft. You'll learn the techniques and secrets of producing gourmet French dishes with fresh, local ingredients. Classes are restricted to 10 people. For more information on these and other tours, contact Adeline at her website Esprit de Paris. " Adeline Marchand is the owner of Esprit de Paris, a unique tour guide service offering visitors the opportunity to experience Paris from the eyes of a local and to be truly immersed in Parisian culture. Having grown up in the trendy, creative and historic Paris neighborhood of Upper Marais, Adeline shares her expertise and understanding of Parisian life in a way that cannot be found on the standard tour bus. Adeline has a master’s degree in 18th century French history from the Sorbonne with a focus on the Grand Tour, an aristocratic rite of passage in addition to having educated herself through experiences with the curator of the Louvre Museum, working with collectors at the International Contemporary Art Fair and even assisting writer Olivier Cadiot and director Ludovic Lagarde at the Festival of Theater in Avignon. She enjoys sharing her passion and knowledge of the City of Lights with visitors with a strong awareness of what it’s like to be in a foreign country having traveled throughout the world herself. Her goal is to allow tourists to become locals during their holiday while catering to their particular interests. Recently, I had the opportunity to ask Adeline more about her company and she kindly provided me with additional insight. Europe Travel: How long have you had your business, and what made you decide to start your Parisian tour company? 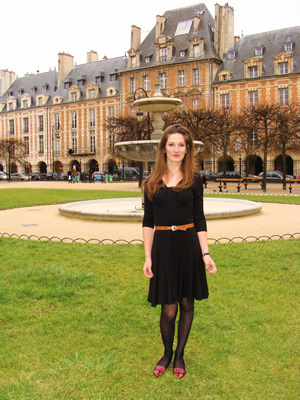 Adeline Marchand: I started my business of private tours of Paris two years ago. My father, who used to work for an American multinational banking corporation, started a new life a few years ago, and created a Bed & Breakfast in our family house, in the Marais (the historical center of Paris), Bonne Nuit Paris. One day, he told some of his clients that I studied history at the Sorbonne. The mother and her daughter, who were from the USA, asked me if I could go around the area with them to give some explanations about the buildings, and to make them “feel” and understand the city. And I had a lovely time! The cultural exchange is very exciting for me. Adeline Marchand: I receive travelers from the USA, France, Germany, United Kingdom, Japan, Bahrain, Saudi Arabia, Singapore, Australia, New Zealand – all types of travelers make it an interesting experience for me. I appreciate and understand the couples, the families, and the women traveling alone. I have noticed that people who travel often are more open to alterity; they often seem to be more curious and they will ask very respectfully how things work here (in Paris) instead of trying to get what they have at home. I particularly enjoy spending time with teenagers on their own because they are very receptive. It often happens that parents frequently ask me to introduce Paris to their teenagers. Europe Travel: What are some of your more unique tours? Europe Travel: What might tourists expect to get out of your tours that they may not be able to experience with others? Adeline Marchand: My tours are exclusive because my clients will discover the essence and soul of Paris, this special way to be sophisticated but nonchalant. I will try to reveal the mentality and customs of the French. The cultural and intellectual life of Paris needs context and history to be fully appreciated. We will visit private mansions, museums, secret places, lovely gardens, cafés, and I will help tourists to discover the cultural heritage, lifestyle, sophistication and creativity of Paris. Europe Travel: Which of your tours tend to be the most popular? Adeline Marchand: It is the Marais tour and the Château de Versailles tour. They are my favorite tours too! 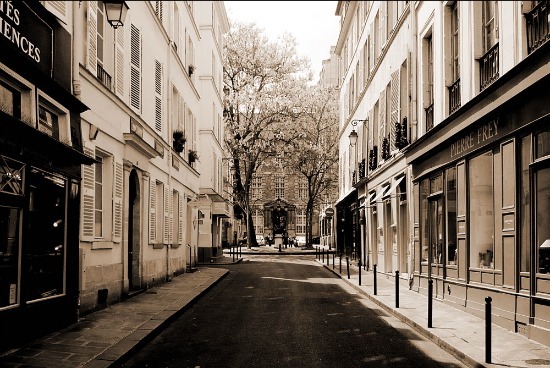 I have been raised in the Upper-Marais, a very creative, trendy and historic area, said to be shabby chic. So I know its charming places and their secrets… And I received a master’s degree in 18th century French history, which the period when the Château de Versailles was inhabited by the King and the Royal Court. I love this time of sophistication, pleasure, refined decadency and violence. Europe Travel: Do you recommend a particular time of the year that might be best for travelers visiting Paris? Adeline Marchand: Paris is the most visited city in the world because each time of the year is wonderful! It rains, although lightly, often in Paris, and the city is still charming. We take an umbrella and life goes on! And the color along the riverside is amazing on a rainy day! In spring, summer, and autumn, the monuments are really crowded, but you can enjoy the liveliness of the terrace of the café and experience the favorite hobby of the Parisian: people watching. Each Parisian has the feeling of being someone important. Self-confidence, conviction, enthusiasm and a mysterious allure, that’s the characteristic of the Parisians. Europe Travel: What are a few of your favorite spots in Paris? 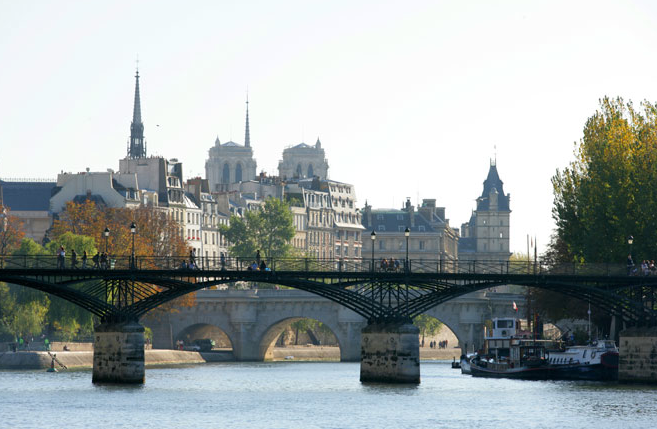 Adeline Marchand: The Pont des Arts offers one of my favorite views. I love the Ile Saint Louis for the charm and the quietness of the riverside. 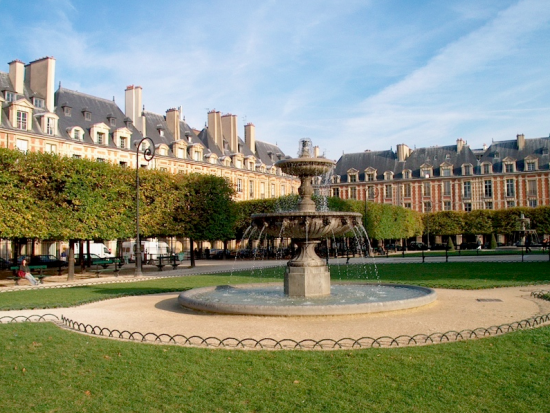 The Place des Vosges is incredibly beautiful and this is where I spent my teenager years. As far as bars, restaurants, and clubs, it is continually changing in Paris. Parisians are like bees with flowers! I have dinner in the 7th or the 17th arrondissement that tend to offer very good restaurants and then I go out in the 2nd, the 3rd, and the 6th arrondissement (various districts of the city). Esprit de Paris and Adeline Marchand can be reached via email at: adeline@esprit-de-paris.com. Her website iswww.esprit-de-paris.com. Paris Sharing, louer l'appartement d'un Parisien. Adeline Marchand est guide touristique. Après des études d’histoire à la Sorbonne, elle propose de faire découvrir la culture française à des étrangers, faisant vivre l’histoire de Paris et en dévoilant les secrets d’aujourd’hui. Son site internet s’appelle l’esprit de Paris. Adeline affectionne tout particulièrement Le Marais, ce quartier bohème chic, débordant de vitalité artistique et créative. Pour elle, la splendeur délabrée de ses beaux hôtels particuliers du XVIIe – XVIIIe lui donne un côté poétique et décadent. C’est à la Place des Vosges que nous l’avons rencontré. Vous êtes parisienne de naissance ou de cœur ? AM : Je suis née à Paris, sur l’Ile de la Cité à côté de Notre Dame, et je suis une Parisienne de coeur! Mais être Parisienne est plus un état d’esprit! Justement, que signifie “être parisienne” pour vous ? AM : La Parisienne est libre! Elle adore connaître les règles, pour mieux s’en affranchir. Elle est sûr de son goût, mais ne manque pas de fantaisie. Elle adore surprendre et faire le contraire de ce qu’on attend d’elle: elle est provocatrice, cultivée, désinvolte, séductrice, et un brin insolente et moqueuse. Elle est élégante avec simplicité et sans être conformiste. Et elle ne se prend pas au sérieux. En fait, elle parle avec sérieux des sujets frivoles, et avec légèreté des sujets graves. La Parisienne est auissi un mythe, qui n’existe que dans le regard des autres. Et vous par rapport à cette idée d’une parisienne ? AM : Le bonheur de vivre à Paris, c’est justement de ne pas entrer dans une case et de pouvoir exprimer plusieurs facettes de sa personnalité! En quoi votre intérieur traduit-il un style parisien ? AM : Mon intérieur est un mélange d’ancien (parquet – moulure) et de moderne. Mais j’aime beaucoup le charme des objets et des meubles anciens. Chez ParisSharing, notre volonté est de partager une certaine joie de vivre, dont Paris est un symbole dans le monde. Qu’aimez-vous partager de Paris en particulier ? AM: J’aime être assise à la terrasse d’un café et regarder les gens passer, ou me ballader à vélo dans les petites rues de Paris. Pourquoi est-ce que Paris est associé à la joie de vivre? Peut-être parce que les Parisiens aiment faire la fête, prendre le temps de vivre et prendre soin de leur apparence… Peut-être également parce qu’on se doit d’être enjoué avec son interlocuteur. Parlez-nous de votre activité et comment il participe à votre joie de vivre et à celle des autres. AM : Lorsque je fais visiter Paris, je dois m’adapter très vite à mon interlocuteur. Une famille américaine très croyante ne sera pas forcément amusée par le libertinage du XVIIIe siècle, les maîtresses des Rois et le Parc aux Cerfs… Une famille Saoudienne vivant dans l’opulence ne sera pas ébahie en visitant nos plus beaux Hôtels Particuliers. Alors je dois trouver un nouvel angle d’attaque pour mettre en valeur la culture française et faire rêver mon interlocuteur. La vie des Cafés et le chic décontracté des Parisiens feront d’avantage rêvé des personnes détachées de toutes contingences matérielles. J’espère apporter de la joie de vivre en faisant vivre ce mythe de Paris, en nourrissant le rêve que les voyageurs ont quand ils viennent à Paris! Sans certaines clés, on ne peut pas comprendre l’état d’esprit des Parisiens. Parfois, le choc culturel est intense, et j’essaie d’arrondir les angles. Une chinoise ne trouvera pas charmant que la cage d’escalier d’un hotel particulier, fut-il du XVIIe siècle, soit délabrée, et sera choquée par les prix de nos vêtements! (d’autant plus qu’ils sont fabriqués en Chine). Enfin, l’un de mes bonheurs tout simple est de me dépacer à Paris en vélo, et j’aime faire découvrir ce mode de visite aux touristes qui font appel à mes services de guide. Quels sont deux ou trois lieux dans Paris qui vous sont chers ? AM : La Place des Vosges, le Pont des Arts, L’ile Saint Louis. Quelles adresses avez-vous envie de partager ? - la Laiterie Sainte Clotilde, 64 rue de Bellechasse 75007, simple et bon, ambiance jeune et décontractée dans un quartier à l’élégance discrète. - chez Léon, 32 rue Legendre 75017. Cuisine française traditionnelle, restaurant confortable pour les hédonistes grisonnant. Délicieux! Ce qu’on a dans l’assiette est trop souvent décevant dans les restaurants branchés. On peut sortir après le dîner! - Moon Young Hee, 62, rue Charlot 75003. Créatrice coréenne, poétique et déstructuré. - Paule Ka, 20 rue Mahler 75004. Marque française marquée par le style des années 50. Chic, épuré et moderne. - AB33, 33 rue Charlot 75003. Multi-marque au style romantique, délicat et bohème. - Jet Set, 7, rue de Sèvres 75006. J’adore leurs chaussures!! Fines avec une touche d’excentricité! - Merci, 111 boulevard Beaumarchais 75003. Temple de la bobo attitude. Plein d’idées originales. - le Café Charlot, 38 rue de Bretagne 75003. Bon spot pour boire un verre dans ce néo-bistrot faussement ancien.